Super fun treats! I just love the yummy pretzels and that tag is adorable! Awesome job on this! How yummy to those pretzels look! Great tags.......48 wow, you have been busy! These are FABULOUS!!! LOVING those tags and the pretzels look YUM!!!!!!!!!!!!!! Very cute, awesome gift package. WOW! 48? You are AWESOME! They turned out terrific! The tag is just perfect! So Fun and cute!!! 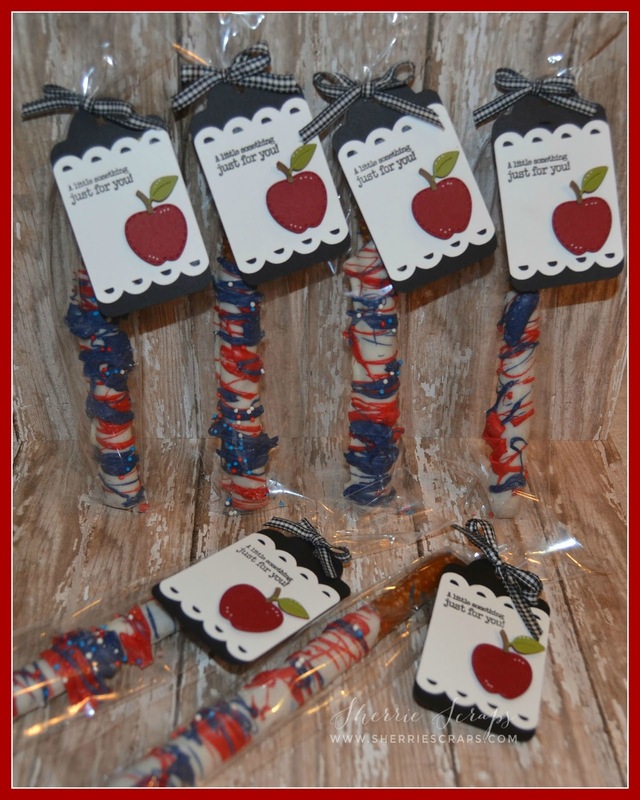 Great Treats for the kiddos!!! I love the pretty apple! Cute & Fun! Yummy too! These are super cute, and of course a healthy choice for the kiddos.... Beats having chocolates...LOL! What a great treat!!! These tags are so super cute!! Love the little red apple!!! Have a great day. 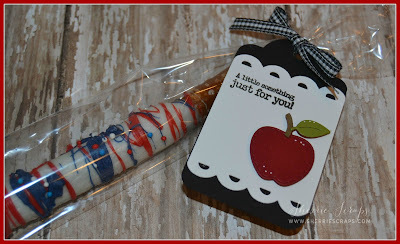 Super cute treats and tags, I need to try making these!! This is so sweet and yummy-- I would love to make these and then I would love to eat them. So I am not making them But I sure like seeing yours!!! Love the tags! That apple is just perfect and the tags are simple yet decorative. You did an amazing job my friend! Hope you are having a good week thus far! That's a lot of yummy cuteness! The pretzels look delicious and the tags are really sweet. I bet the kiddos love these fun treats! 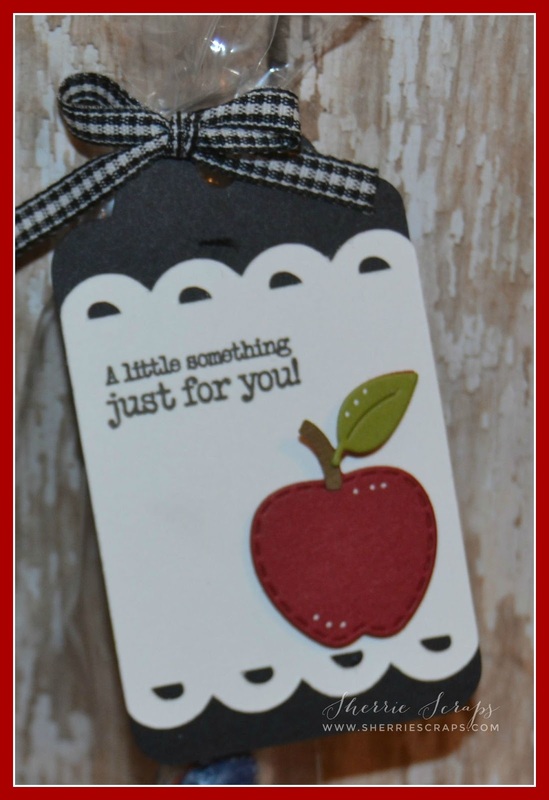 Your tags are so very cute and what a perfect treat for back to school! What a cute treat. The pretzels look yummy and are wrapped up perfectly. Love the tag with that cute apple. Love the cute apple tags and the pretzels look yummy too. 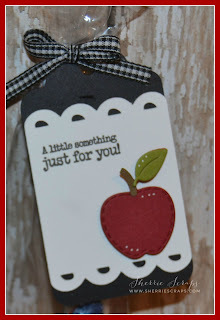 Thank you for joining in our blog challenge at SweetStamps.com. Sherrie ~ Oh my these look so YUMMY! What I LVOE about these besides the tag and details is that you personally make them! OMG when do you find the time??? I am beyond impressed with you ~ seriously!! Plus I have to say I LOVE gingham! These are so super AWESOME!!!!! LOVE LOVE LOVE chocolate covered pretzels!!! I didnt realize I was so behind in commenting on your blog....so so sorry!! !